17:47. * 1/2. Indomito was DQed in the third, but the rudos were pinned anyway. straight falls. 8:49. *** 1/2. 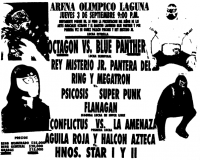 ****, 15:22 Panther's second was Huichol, Rey Misterio was Angel Azteca. Panther won via nudo. Venus was hurt in the second fall, and the rudas were DQed for excessive violence. ** 1/2. straight falls. Mascara Sagrada pinned Estrada. Tinieblas' mask was pulled in the first fall. *** 1/2. Lizmark won the last two falls for his team and challenged Universo. *** 1/2. Indomito pulled Volador and Fantamsa's masks for the DQ. Aguayo submitted Estrada. Estrada replaced Ice Killer. Konnan attacked rudo refs el Capitan and Vaelinas for the DQ. 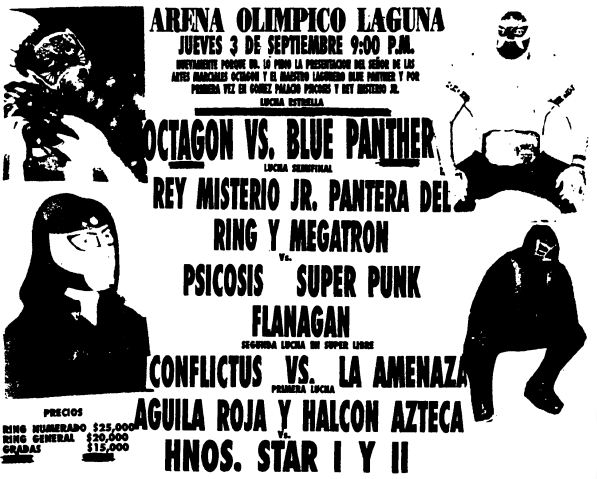 Bestia Negra was a replacement for Sicodelico. Sicodelico was suspended 15 days for missing many shows. 1) Cien Caras & Fishman DQ Konnan & Perro Aguayo Sr.
Aguayo fouled Caras for the DQ. 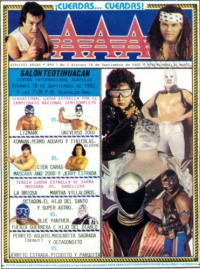 infamous match where Pinocho ripped of La Parka's mask so a photographer from Titanes del Ring could snap a photo of his face and reveal him to be Principe Island. This got Pinocho blacklisted from AAA and broke up Trio Fantastia for a time. Villalobos (hair on the line) pinned Briosa with a second rope splash to win in 15:32. * 1/4. La Brioas was announced as Sara Oliva Alvarez Gallegos, 30, daughter of Sugi Sito, 14 years a wrestler. 9:27, ** 1/4. Aguayo faked a foul for the win. Earlier in the match, Mascara Ano tossed a bucket of water on Perro. 16:38, ****. Lizmark won via powerbomb in his hometown. 10:40. Psicosis unmasked Super Calo for the DQ. ** 2/3. 16:19, ***. Rudos were DQed for shoving Tirantes out of the ring. 17:40, ** 1/2. Astro pinned Estrada. 20:01, ***. Straight falls. Fishman pinned Perro after a chair shot.